A question came up this week about the best way to kindly change flute teachers. It's a tricky situation, as teachers and their students, working for years on musical development and performance projects, can grow quite close as they share many formative experiences in music together. They can be as close as co-workers in any Arts project, and these can be emotional as well as intellectual friendships. So, how can you change flute teachers without damaging your current flute student and teacher relationship? "I've felt the need for a new way of looking at my flute playing, and thought that it was time for me to get input from a different perspective. Maybe lessons with a different flute teacher could offer me a new point of view, or the jumpstart I need to hear things a new way; sort of an alternative flute refresher course. Is it alright that I start looking into taking some lessons with another teacher? Do you need several weeks or month's notice? I've truly and deeply appreciated everything you've done to help me; I just feel the need to change the way I hear things." Often the teacher knows already that you need a change, and it's great when the student speaks in respectful "I" statements. All of us have the need for a change, or another fresh perspective. Starting fresh repertoire refreshes our relationship with our instrument. Hearing new flute styles and new ways to learn and critique shows us new ways to listen to our own playing. And of course, going to Masterclasses with alternative flute masters refreshes our flute understanding, and lends new ideas in how to enrich our own playing. The above are all strong reasons to refresh our point of view. Lessons with another teacher can help clarify our goals and our practice habits. Even the same information given in a new voice can be helpful to jog our understanding. Those readers out there who are teachers and students with experience with this particular issue, do chime in and give your thoughts on this topic too please. Great illustration, sailors tacking, following the wind - and great advice! If the relationship has been based in respect, trust and kind consideration all along, the transition will be easy. We continue to grow together until it is clear that more room or a different light is needed - but that doesn't imply failure. It has been said, that the crowning achievement of any mentor comes when the student surpasses the teacher. Great topic, Jen...and an important one often overlooked and not discussed. Private teaching and study is one of the most difficult relationships to break smoothly and without remorse or bad feeling. I think it is very good for students to have other points of view, hear other ways of explaining or interpreting things, or just getting a shot of new energy from new or additional ideas, BUT the worse situation I have ever encountered is when a student starts studying regularly with another teacher (say, over the summer) without discussing the situation with me or sharing and going over how to integrate or overlay the new ideas and methods they learned with what we have been doing in lessons with me. So true; human beings; you can't live with them, and you can't put your head in the dirty dishes and turn the water on either. Yes, seriously, as we all know, people get along with others with various degrees of success. One teacher or mentor may suit some students better than others. So we all have to let go of needing strict continuity. I've always felt that my students SHOULD visit other teachers. Very often the teacher reiterates the same pointers, and that really helps a student hear it again. And I think learning to work with a variety of teachers is a big part of an instrumentalist's overall education. When I would get close to a concerto or competition, my teacher would send me for refresher lessons with vocalists, pianists, and other experts. It really helped. But yes, I know about the misguided moments too. Eek. This is all true (although I might not ask permission from a teacher I was about to leave so much as say everything you said except that!). It is so true that you need to both keep seeking out new insights and inspiration (and challenge) and yet be thankful to the teacher who helped you along the path as well. What you're saying works both ways, too - once I had a teacher decide she didn't want to teach me anymore. To get rid of me, she actually sent an overnight letter with return receipt (I remember it was like $11.75 postage) saying I was no longer her student! I was like 16 years old, had no idea what went wrong, and just suddenly received what felt like a notarized letter informing me of her decision. Very strange! Thanks for your insights, Lisa. Too strange about that letter. Whoa! J.
I'm sorry Jennifer, for lack of blog experience I'm throwing this comment here. My name is Alastair and I am an Eastman grad in flute performance... I'm getting back into performing again and have noticed for years now having to adjust my left hand position just to relax. Even still it seems a bit odd, I've never really had good consistency with it. I have been looking into extensions but I can get to the keys just fine. I have been very blessed with your youtube videos talking through hand position etc... some things I never got when I grew up playing. In fact i am one of the flutists never corrected who looks down int the instrument and already am having back tension problems at age 28... your video has helped me out I feel for sure... I'm alot more upright turning my headjoint in. I guess my question is, I feel like if I can find a way to get where my left hand hits the flute, away from the intsrument that will free the hand up... i feel like i have the reach. I noticed your pencil grip / tack solution. I can defenitely try that... any other ideas that you have run across? Thanks so much. I try cliping on a right hand Be-pop thing, but it was akward. Blessings, thanks for consolidating and blessing us with the information. I was just working on this very problem for my book. So it's a good day to ask that particular question. If you look at the Lea Pearson book "Body Mapping for Flutists" you will see the correct "mapping" of the forearm bones. Little known to flutists before they have arm problems, but these two have to stay flexible in their rotation to hold the flute. Study the diagrams of the two bones in the forearm, and be sure that you can continue to move them flexibly in tiny tiny figure eights while playing a G. That's the first step. A locked forearm leads to more problems farther up the hold position. So unlock it every three minutes, and keep it loose like a violinist does during a lush vibrato. Next, the wrist; there are five bones in the wrist, and they also will want to be free to rotate and move in their positions, so that there is no "locking" at the wrist. The easiest way to relieve pressure from the left wrist before placing the fingers is to hold the flute with the right hand on the barrel as shown in the youtube videos of Fluteloophost (original idea from P. George). With right hand on the barrel flutists can experiment with ZERO left hand tension, and no forearm or wrist tension. And they can reposition the left hand to meet the barrel in a more natural position for the wrist. This takes time, and every individual has different finger lengths. And here's a new way to look at it: if you look for the true length-wise balance point of the flute, (by safely balancing it on one finger over a very soft and safe landing spot!) and then place your right thumb at that balance point, (RH fingers resting lightly on the rods, and not needed for this experiment), you can play B A G up and down with no left hand tension what-so-ever. Very helpful to de-tension the left hand when warming up, or between other practice. Pushing forward more with the right thumb on the back of the flute, and pivoting on the left index is also very useful. This is shown in the youtube videos. And the sponge-like grippy pencil-grips (I use two) really help re-train the LH index not to push the flute inward. Hope these all help as experiments. 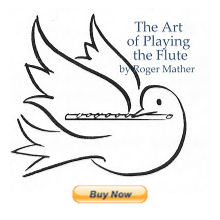 Fiona Wilksinson's very excellent relaxing book: "The Physical Flute". I'll write this up as a future blog post with pictures. It's alot of information to blurt out. ha. J.